St. Paul says that our primary battles are not physical, but spiritual (Eph. 6:12). Because this is true, we need to sustain each other in prayer. We invite you to join us in praying a novena for our students from August 20th - August 28th leading up to their arrival on campus and the start of the academic year. Students, we invite you participate by praying for your friends and classmates! The word novena is taken from the Latin word “novem,” which means "nine". Novenas are made up of nine days of prayer and meditation and are often composed to invoke the aid of a saint for a particular reason. 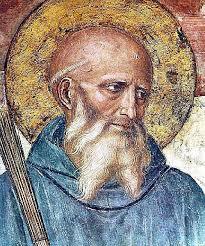 That is why we have put together a novena to our patron, Saint Benedict, with meditations from his rule. Novenas are an ancient tradition dating back to the days of the Apostles. Jesus told His disciples to pray together after His ascension into heaven, so they went to the upper room along with the Blessed Virgin Mary, (Acts 1:14) to pray together for nine days. These nine days of constant prayer proceeded Pentecost, the descent of the Holy Spirit upon the disciples as “tongues of fire” (Acts 2:1-4). We pray novenas in imitation of the model of prayer set before us by Our Lady and the Apostles. Download a PDF version of the novena here. Lord our God, in your wisdom and love you surround us with the mysteries of the universe. Send your Spirit upon the students of Hope College and fill them with your wisdom and blessings. Grant that they may devote themselves to their studies and draw ever closer to you, the source of all knowledge. May the desire for holiness and the devotion to prayer increase in our students and in our own hearts. We ask for the intercession of Saint Benedict, our patron, Messenger of Peace and Herald of the Christian Faith. “First of all, every time you begin a good work, you must pray to him most earnestly to bring it to perfection” (RB, prologue, 4). “Your way of acting should be different from the world’s way; the love of Christ must come before all else” (RB, 4, 20-21). “Idleness is the enemy of the soul” (RB, 48, 1). “Just as there is a wicked zeal of bitterness which separates from God and leads to hell, so there is a good zeal which separates from evil and leads to God and everlasting life. This, then, is the good zeal which monks must foster with fervent love: They should each try to be the first to show respect to the other (Rom 12:10), Supporting with the greatest patience one another’s weaknesses of body or behavior, and earnestly competing in obedience to one another” (RB, 72, 1-6). “Let [us] prefer nothing whatever to Christ, and may he bring us all together to everlasting life” (RB, 72, 11-12). “Do not aspire to be called holy before you really are, but first be holy so that you may more truly be called so” (RB, 4, 62). “Whenever we ask some favor of a powerful man, we do it humbly and respectfully, for fear of presumption. How much more important, then, to lay our petitions before the Lord God of all things with the utmost humility and sincere devotion. We must know that God regards our purity of heart and tears of compunction, not our many words” (RB, 20, 1-3). “Yearn for everlasting life with holy desire” (RB, 4, 46).